For the longest time I confused watercress and plain old cress. That the former was far bigger and differently shaped did not help me see my error: I just assumed it was fully grown, deformed cress. When, whilst eating a tendril of the former in amongst other mixed leaves, I was assaulted by an overwhelming pepperiness rather than a cooling cucumbery-ness, I still did not question the relation of the two: I just thought my watercress had been tainted by some foul tasting plant! Good news: It can be grown in the UK all year round, meaning I can enjoy a watercress sandwich in January safe in the knowledge it did not need to buy an airline ticket just to come visit me. Good news: It’s chockablock full of vitamins, minerals and antioxidants (is the latter one of the former?). Gently soften the onion, celery and garlic in the butter and oil. Add the potatoes and wine and turn up the heat. Cook until the harsh alcohol vapours disappear. Add the stock and bring to the boil. 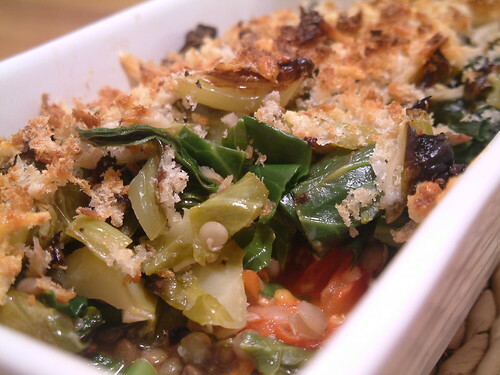 Reduce heat and simmer until the vegetables are soft. Take off the heat. 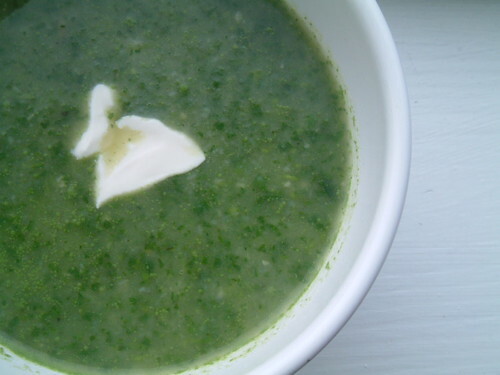 Add the watercress and blend to create a smooth, intensely green soup. Season and serve with a dollop of yogurt. This next “recipe” was requested by a few of you earlier in the week. I haven’t written out Cotter’s basic hummus recipe as I imagine many of you will have your own or may find it simpler to buy the hummus. 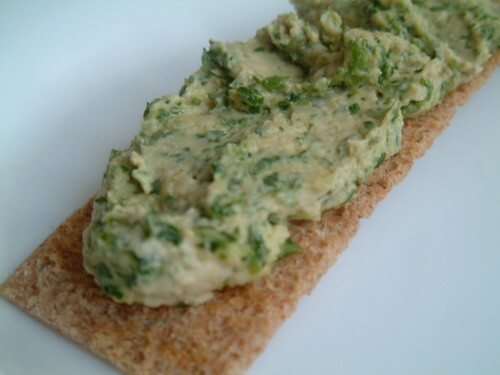 Simply whizz the watercress in a blender with a little olive oil until it is a smooth puree. 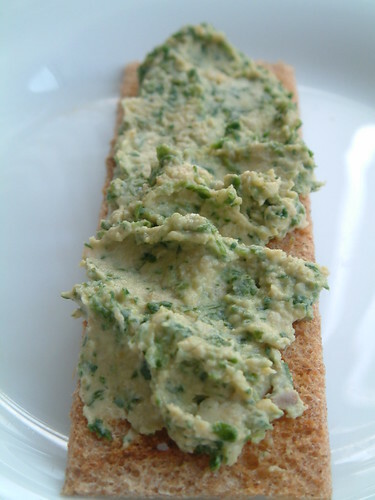 Stir the watercress puree through the hummus. 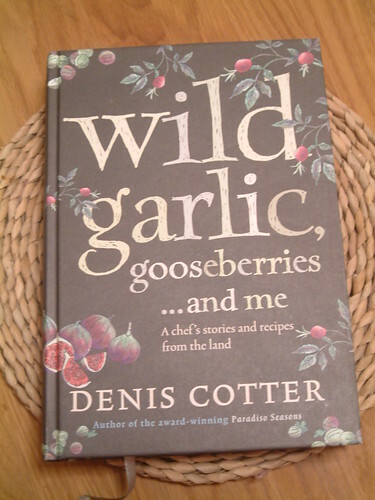 One of my favourite gifts this Christmas was Dennis Cotter’s new vegetarian cookbook, Wild Garlic, Gooseberries… And Me. Full of stunningly earthy photographs; Slater-esque anecdotes; elegant recipes and a plethora of information about growing and preparing vegetables, it’s one of those cookbooks which I’m unsure whether to keep by the bed or in the kitchen. 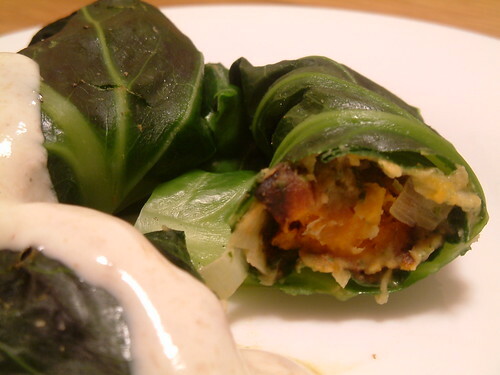 Taking time and effort, the recipes in this book are generally not 30 minute, weekday dishes. But if you’re anything like me, you’ll enjoy spending time preparing these dishes and if you’re not, the results are worth it! Everything I have tried out has been delicious and each dish has made dinner feel like an occasion. Yes, I am going to rave about Yotam Ottolenghi again. My new favourite chef, Ottolenghi’s recipes feature weekly in The Guardian and are truly inspired. He has a book coming out soon – can’t wait! 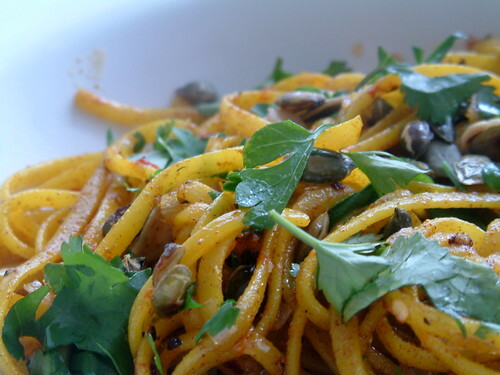 Tried out this week’s recipe, Saffron Papperdelle with Spiced Butter, for lunch today and it was a real delight. Warmly spiced and richly coloured, a small portion of this would make a very elegant starter. You can find the recipe here. Though this could never be a low fat dish, you do NOT need 200g of butter for four people. I used less than half of that and it was more than ample. Also, I recommend using tongs to lift the buttered pasta out of the pan and on to a plate. This reduces the amount of butter in each serving. I used dried tagliatelle cooking it in a large pan of water flavoured with 1 tspn saffron and salt. Pine nuts were replaced by sunflower seeds. Mint was replaced by coriander. 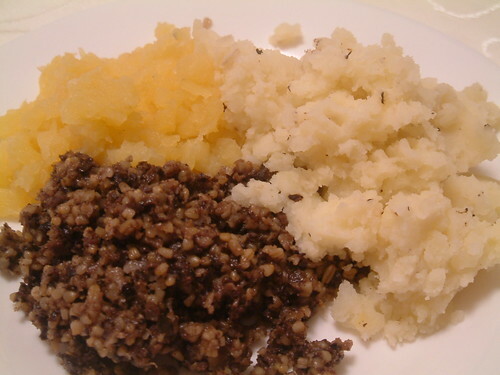 The haggis is a species in the class of Mammalia Puddingous. This ellusive animal is found predominantly in the windswept Highlands of Scotland though unsubstantiated sightings have been made as far south as the Border town of Peebles. 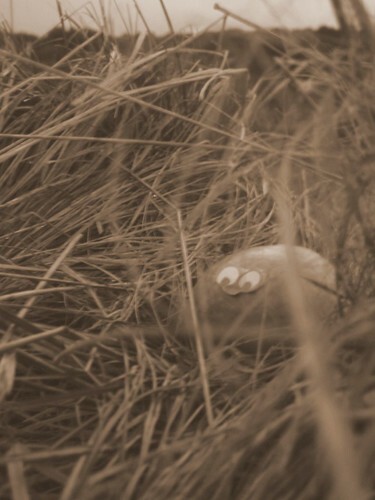 To date, the above picture (taken in 1897 near Loch Duntelchaig) is the soul photographic record of the haggis’ existence. A very shy creature, its preferred habitat is heather moorland far from human settlements. In these barren regions, lone haggis build nests deep in the roots of the extensive heather coming out at dawn and dusk only to feed. During the summer months haggis eat mainly insects and green plants, whilst in winter they forage for roots. Haggis mate only once in their lifetime and generally produce a single offspring. Despite this and despite their reputation as being utterly scrumptious, haggis numbers are still strong. 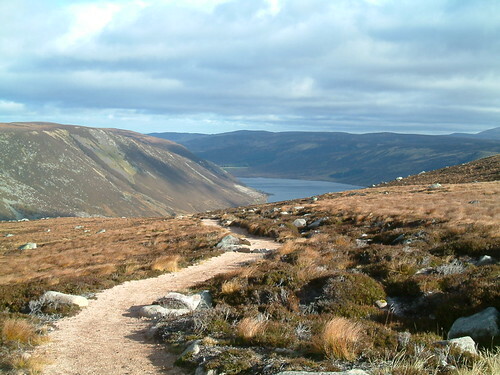 According to the last Scottish Executive-funded “haggis count” (whereby vast lines of participants walk through the heather heaths imitating the gurgling sound of the beasts and listening for haggis’ reply call) there are an estimated 100,000 in the Easter Ross area alone. The meat of haggis has been a delicacy in Scotland for hundreds of years and is, indeed, so possessively prized that Scots have been known to spread false rumours in the hope of reducing the dish’s popularity. Perhaps the most ridiculous and famous of these rumours is the idea that not only is the haggis not a real animal, it is made from finely chopped animal innards encased in a sheep’s stomach. For the full poem and translation, click here. Always make too much mash, for the leftovers can be turned into potato cakes the next day. 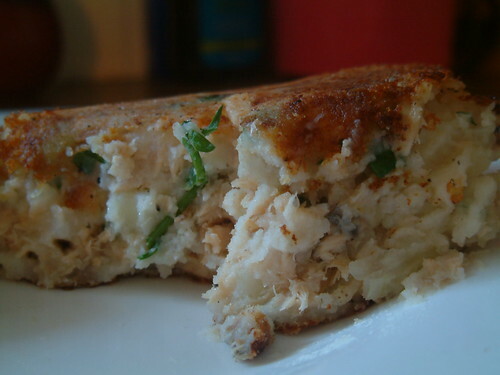 More often that not, my potato cakes consist of nothing more than well seasoned mash, mixed with spring onions and fried in a little butter – yum yum – but for a more substantial meal, I like to make simple fish cakes by mixing a tin of salmon with double the quantity of mashed potatoes and a generous handful of chopped parsley. Fried gently in a little olive oil and served with salad, it makes for a very comforting, very tasty and very easy dinner. I’ve mentioned my terrible breakfast habits before. Despite always being famished from the moment I wake up, I often don’t make time for the first meal of the day. Winters are the worst. From November to March when my alarm goes off it’s dark outside and the lack of natural light makes waking up a real struggle. On these weekday mornings given the choice of 10 more minutes in bed or a nutritious breakfast, I invariably choose the latter and end up munching on white toast and jam in front of my registration class. It’s not the best start to the day and it’s not a very good example to set either. It’s got to be quick and easy to make. It’s got to be filling. It’s got to be tasty. 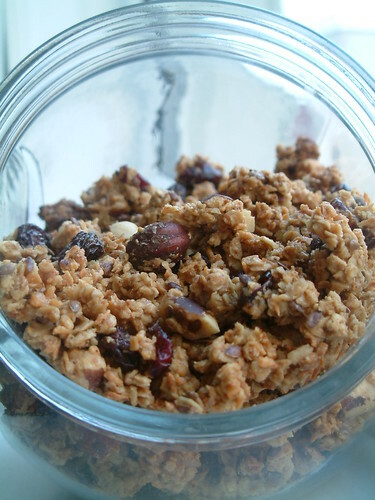 When I saw a post on Warda’s blog for “The Best Granola”, it seemed like a good place to start. Altering the ingredients to suit my whims and my storecupboard, I whipped up a batch on Sunday afternoon and was very impressed with the gently spiced, super-crunchy results. Though a bowl of this alone would be a little sweet for my taste (perhaps all granolas are? I’ve never tried it before), sprinkled over a blander cereal like Weetabix, it’s the perfect start to a day. Mix the porridge, bran, flour, coconut, cranberries and nuts in a large bowl. Melt the butter and honey gently in a small pan until a smooth consistency. Add the spices, vanilla essence and salt. Stir well. Add the wet ingredients to the dry and combine well using your hands. Lay the mixture out on baking trays lined with baking paper. Bake in the oven for 45-1 hour taking out frequently and turning mixture to brown evenly and break up into small chunks. The granola is ready to be taken out the oven when dried and evenly browned. 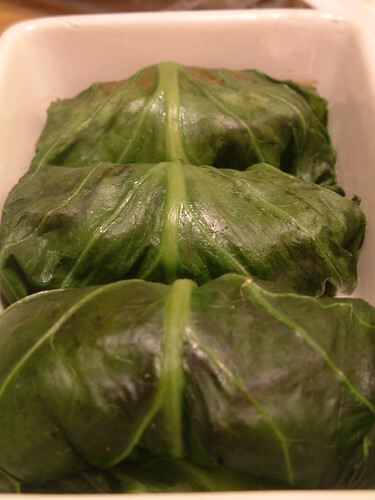 Leave to cool before storing in an airtight container. I’m pretty awful at remembering birthdays. Moreoften than not on the actual date of the birthday I suddenly realise it’s a special day for my sister/friend/niece/etc and panic. I call. I apologise profusely. I send a belated card and gift. I vow to start writing reminders on my calendar. I fail to do the latter and so the following year I repeat the cycle all over again. To mark this first birthday I want to share a recipe that I not only make very frequently but is also one of the very first dishes I learnt to make from scratch. It’s a recipe that I’ve actually blogged about before but that was way back when this blog was only read by Deb and… ummmm, actually I think it was only Deb! Anyhoo, the dish is a winner. It’s easy, it’s fast and it’s bursting with flavour. Heat oil in wok over med-high heat. Stir-fry garlic until golden. Add prawns and chilli. Stir-fry till prawns are cooked. 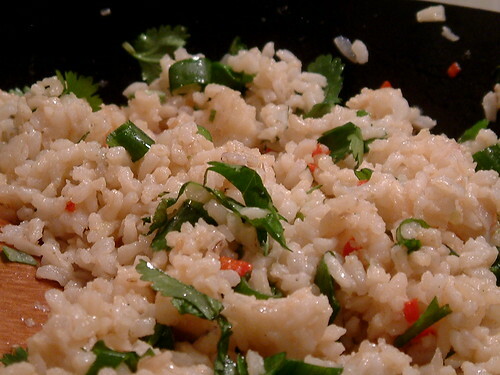 Add rice, sugar, fish sauce & soy sauce. Heat through and combine gently over medium heat. Stir through spring onions, basil and coriander. Cook for one more minute. Serve.